“They looked from CCHQ press release to The Sun, and from The Sun to CCHQ press release, and from CCHQ press release to The Sun again, but already it was impossible to say which was which”. Orwell would have marvelled at the transformation from newspaper to propaganda machine, but might have stopped and thought that Animal Farm and 1984 had morphed into one single and very real horror show. Indeed, after yesterday’s Budget, which tinkered around the edges with such trivialities as taking a penny a pint off beer duty - you’d have to spend an awful lot of time at the bar, visiting the toilet, sleeping it off, or a combination of all three to get a free scoop - to read the Super Soaraway Currant Bun, one might think that some kind of miracle had been performed, that our Chancellor of the Exchequer had superhuman powers. Alas, the Rt Hon Gideon George Oliver Osborne, heir to the Seventeenth Baronet, possesses nothing of the sort, and no amount of low-rent cheerleading from Rupe’s downmarket troops will alter that fact. Economic growth in the North of England is advancing at a greater rate than for the South? Whoopee-do: it’s coming from a rather lower base. A hundred per cent of bugger all is still, to no surprise, bugger all. Wages are rising at a faster rate than headline inflation? I refer the Hon Questioner to the answer I gave earlier: those wages still haven’t made up the ground lost since the financial crash. There’s good news for savers? 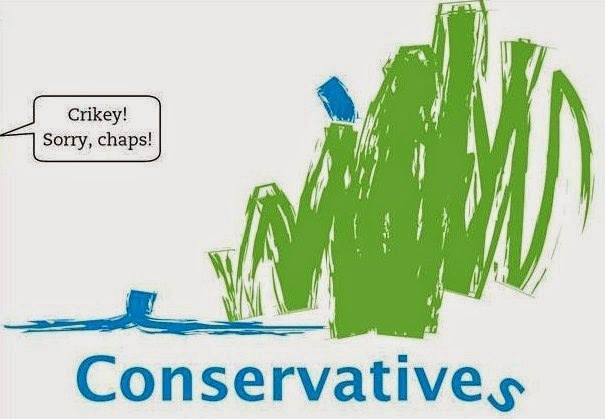 Er, hello Murdoch poodles, how do you think we get the economy moving? Clue: you don’t achieve that by getting the population to squirrel away their dosh. You need to get them spending it. 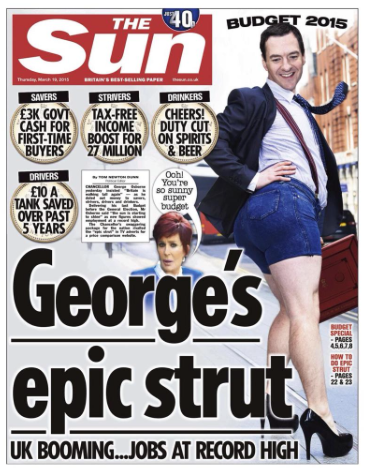 That the picture painted by today’s Sun - quite apart from the bizarre suggestion that Osborne may be involved in some kind of transvestite activity - is utterly bogus is not hard to demonstrate. We know this because of the previous day’s front page story in a newspaper called, er, well, the Sun, actually. 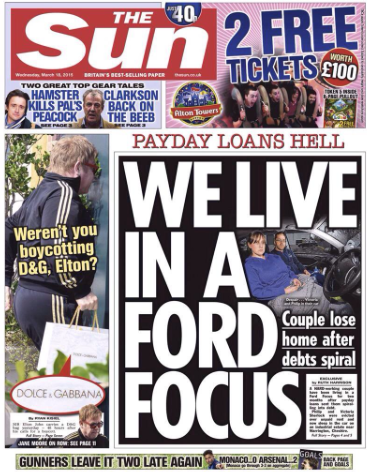 “Payday Loans Hell … WE LIVE IN A FORD FOCUS … Couple lose home after debts spiral” shrieked the headline. While the Sun proclaims the wonders of yesterday’s Budget, most of those hardworking people they and the Tories pretend to champion will notice a difference not unadjacent to diddly squat. And, as the Guardian has told, “In 2013-14 food banks helped feed almost a million people in the UK, about a third of whom were children”. Many food banks are supporting people not just occasionally, but for months on end. Giving the less well off a tax break means only that they are marginally less badly off: it does not instantly alleviate their situation. But from the Sun’s shameless propaganda today, one might believe all poverty had been eradicated, all economic ills cured. When Owen Jones muses “The Sun is basically now Tory press releases meets Carry On isn't it”, he’s being unduly lenient. The Carry Ons were more highbrow, and actually funny. “WAR IS PEACE … FREEDOM IS SLAVERY … IGNORANCE IS STRENGTH”. You believe what the Sun tells you, you’ll believe that too. Orwell also had a lot to say about misusing words to hide the true meaning of propaganda. So I'm wondering about your use of 'officially' here. It doesn't invalidate your argument, but the irony was worth noting. Their claim of "record low unemployment figures" is also bogus. Firstly, it's a record low in the sense of "Lowest for 7 years". 7 years ago, was let's see now, 2008... the height of the credit crunch and collapse of sub-prime mortgages. So not really a high number to aspire to in the first place. Then there's the rather inconvenient caveat that most of those no longer listed as unemployed are so listed because they are either in 0-hour contracts, or have been sanctioned, or placed into compulsory workfare schemes.